Nutren® Pulmonary is vanilla flavored and can be used for tube feeding or as an oral supplement. It is designed with a carbohydrate level to help reduce CO2 production and respiratory quotient. It has a modified carbohydrate and balanced fat profile for better tolerance. 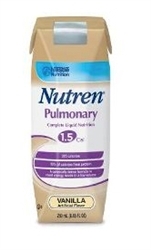 Nutren Pulmonary comes in 250 mL cartons (as shown in image) or ready to hang 1000 mL bags for tube feeding. Nutren® Pulmonary is calorically dense to meet elevated energy requirements in low volume. It has elevated protein to support lean body mass. It has a balanced lipid profile with MCT to facilitate tolerance. Appropriate for lactose intolerance*, gluten-free, low-reside, and kosher. Nutren® Pulmonary provides nutritional support for chronic pulmonary disease, respiratory disorders, ventilator dependency, and fluid restrictions. Water, Maltodextrin, Calcium-Potassium Caseinate (from Milk), Medium Chain Triglycerides (from Coconut and/or Palm Kernel Oil), Canola Oil, and less than 2% of Corn Oil, Soy Lecithin, Calcium Citrate, Magnesium Chloride, Potassium Phosphate, Potassium Citrate, Sodium Phosphate, Salt, Sodium Citrate, Choline Chloride, Citric Acid, Sodium Ascorbate, Magnesium Oxide, L-Carnitine, Taurine, Carrageenan, Alpha-Tocopheryl Acetate, Zinc Sulfate, Ferrous Sulfate, Niacinamide, Calcium Pantothenate, Vitamin A Palmitate, Manganese Sulfate, Pyridoxine Hydrochloride, Copper Sulfate, Riboflavin, Vitamin D3, Thiamine Mononitrate, Folic Acid, Biotin, Sodium Molybdate, Potassium Iodide, Chromium Chloride, Sodium Selenate, Phytonadione, Vitamin B12.